According to latest rumours in the industry, the Cross Cabriolet concept of 2007 will eventually become reality five years after, in 2012. When it was launched back in November 2007 at the Los Angeles Motor Show, the Audi Cross Cabriolet concept caused a big stir in the compact SUV segment and clearly showcased the intentions of the Ingolstadt-based constructor regarding the future models in the lineup. The vehicle, alongside the Cross Coupe concept that came earlier in the same year, paved the way to creating the new Q5 range (and also the Q3 model now in 2011), that officially entered the market in 2008. In the rush to create an almost infinite number of niche versions, it looks that Audi bosses have given the approval on a limited series run for the Q5 Cabriolet, an open-top compact SUV inspired by the 2007 showcar. If rumours are to be believed, then this special Q5 should arrive next year in the garages of just 5,000 clients and compete with the nonconformist Nissan Murano CrossCabriolet, set to gole on sale in the USA this year. The convertible Q5 will come as standard in a two-door configuration, whereas the retractable roof will be manufactured out of fabric, to help keep the overall mass of the car as low as possible and not affect too much the general dynamics and ride efficiency. Even though efforts will be made in that direction, it's pretty easy to judge that the Q5 Cabriolet will weigh well over the current 1,700-1,800 kilos (depending on the engine version) limit of the standard model due to further reinforcement procedures applied to the body in order to counteract the inherent torsion forces a cabrio has to withstand. Inside, expect a very classy atmosphere, with lots of technology gimmicks, such as the latest MMI infotainment system, and upscale materials such as fine leather upholstery in various tones and combinations and striking metal or wood trims that are certainly going to give the interior an uber-premium feel. Moreover, the cloth top will also be available in several colours to match the specially-designed exterior metallic/pearl effect paintworks. The underpinnings will come straight away from the fixed-roof Q5 and will include a permanent, all-wheel-drive quattro platform working together with the frugal 4I and V6 TFSI and TDI engines Audi produces. Given the fact this is an exclusive variant, the base price tag could exceed 35,000-40,000 euros. 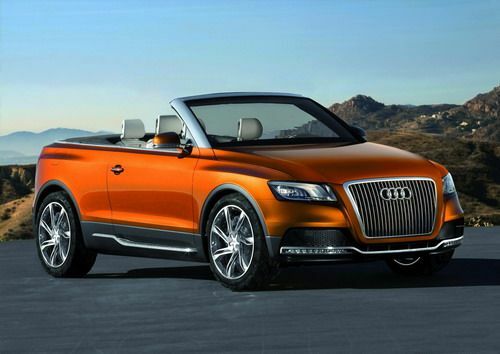 So, start saving money if you plan to travel in style in a distinctive Q5 Cabriolet!